The bike stand will fit almost all bikes range from 20" - 24" Kids Bikes, 26" to 29" Mountain Bikes, 650c -700c Road Bikes, EXCEPT those bikes with the tires more than 2.4" in width.Don't hesitate to buy it! ✓【Foldable & Save Space】- Saving storage when not in use or to carry it into the car when going riding. Your bikes will never be lying on the ground or leaning against buildings or trees anymore. 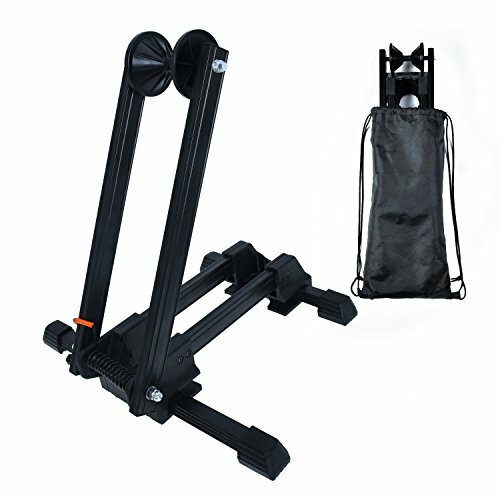 ✓【Perfectly Hold Your Bike】- Most Stable Bike Storage Garage: Spring-loaded arm easily hold front wheel without risk of scratching rim or spokes,The bike's front rear wheel sitting in the holder is much deeper than others, so it stays firmly in the holdder.Dual Arm is better to hold heavy bike than Single Arm Stand. ✓【Portable & Lightweight】- Aluminum alloy material make the bicycle holder light ,only 3.5lbs, make it portable for your outdoor cycling purposes. If you have any questions about this product by Auwey, contact us by completing and submitting the form below. If you are looking for a specif part number, please include it with your message.